IIT JAM Previous Year Question Papers: Joint Admission test for M.Sc. is a very popular entrance exam. Last year it was conducted by IIT Delhi. IIT JAM is being conducted to provide admission into M.Sc., Joint M.Sc.-Ph.D., M.Sc.-Ph.D. Dual Degree, M.Sc.-M.Tech., etc. To get admission into these courses, Candidates have to do the best preparation and Previous Years papers are really a helping mate in it. The conducting authority will release probably last 4 years IIT JAM Previous Question Papers with Solution on their sites. But Here in this article, we are collecting all available papers at a single place. We are providing a table below which have IIT JAM Previous Year Question Papers with Solution. The Key is only for the year 2017 Papers, and in all other, there are only Previous Question Papers. You can download these Papers and start practicing it. Previous Year Question Papers are really helpful because with it you can observe the changes, Marking scheme, Pattern, weightage and time required to solve each type of question and then you can work on it. Now you have previous 4 years IIT JAM Question Papers. But if you want more then the next paragraph is for you. Now we also have some very old Papers and we are sharing it in a folder. 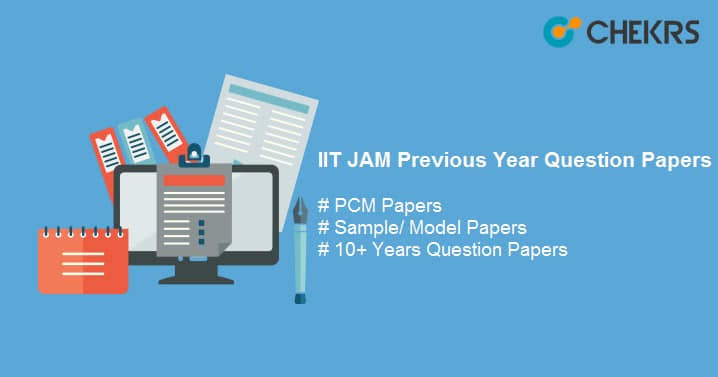 You can get all the IIT JAM Previous Year Question Papers of 2005, 2006, 2007, 2008, 2009, 2010, 2011, 2012, 2013. You can use these papers as IIT JAM Model Question Paper. Just follow the download link and access all the papers at once. Now, After getting these papers, I think your search for IIT JAM Sample Paper will End here. At this page, we provide last 10+ years IIT JAM Previous Question Papers. And It is enough for all your preparation for the exam along with the IIT JAM Syllabus. I hope it will help you. Good luck with your exam and keep visiting.